The Nazca lines are a series of geoglyphs located in the Nazca Desert, a high arid plateau that stretches more than 80 km (50 miles) between the towns of Nazca and Palpa on the Pampas de Jumana in Peru. They are believed to have been created by the Nasca culture between 200 B.C.E. and 700 C.E. The region's dry and windy climate has kept the lines clear. Visible from the air, the designs are less noticeable from ground level. Thus, in the twentieth century when airplanes began flying over this area the markings stirred up great interest. In 1994, the Nazca plain was deemed a UNESCO Heritage Site, in order to protect the ancient creations from modern human encroachment. The lines form numerous individual figures, ranging in complexity from simple lines to stylized hummingbirds, spiders, monkeys, fish, sharks, llamas, and lizards. The Nazca Lines remain one of the many mysteries of the ancient world, with suggested explanations ranging from astronomical calendar, sacred paths, to UFO markings made by extraterrestrials. Thus, the Nazca Lines reflect the creativity of human beings, both in their design and construction by the ancient culture, and in efforts to decipher them by contemporary researchers. The Nasca culture flourished from the first to eighth centuries C.E. beside the dry southern coast of Peru in the river valleys of the Rio Grande de Nazca drainage and the Ica Valley. Early Nasca society was made up of local chiefdoms and regional centers of power centered around Cahuachi, a non-urban ceremonial site of mounds and plazas. Heavily influenced by the preceding Paracas culture, which was known for extremely complex textiles, the Nasca produced an array of beautiful crafts and technologies such as ceramics, textiles, along with the famous Nazca lines and geoglyphs. 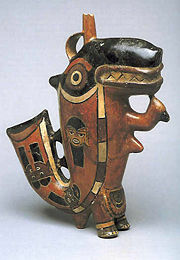 Killer Whale, Nasca Culture, pottery, Larco Museum, Lima, Perú. Nazca subsistence was based largely on agriculture. Iconography on ceramics and excavated remains indicate that the Nazca people had a varied diet composed of maize, squash, sweet potato, manioc, and achira, and even a small trace of various fish. They also utilized several non-food crops such as cotton for textiles, coca, San Pedro cactus, and gourds which were also used to illustrate activities in daily life. In terms of animal resources, the Nasca used the llama and guinea pig for sacrifice at Cahuachi. Llamas were also commonly exploited as pack animals, for their wool, and as a source of meat. No doubt due to the extreme nature of the surrounding environment, much of Nasca religious beliefs centered around agriculture and fertility. Much of Nasca art depicts powerful nature gods such as the mythical killer whale, the harvesters, the mythical spotted cat, the serpentine creature, and the most prevalent of worshiped figures, the anthropomorphic mythical being. Much like the contemporary Moche culture, shamans apparently used hallucinogenic drugs, such as extractions from the San Pedro cactus, to induce visions. Religious events and ceremonies took place at the center of Nasca society, in Cahuachi. During these times, all members of the society in surrounding villages would migrate to the center and participate in feasting as well. Non-elites could obtain highly valued goods such as fancy polychrome pottery. In exchange, the elites could enhance their political power and status while opting the commoners into labor and construction of the site. The lines were made by removing the reddish-brown iron oxide-coated pebbles, which cover the surface of the Nazca desert. When the gravel is removed, the lines contrast sharply with the light-colored earth beneath. There are several hundred simple lines and geometric patterns on the Nazca plateau, as well as over 70 curvilinear animal and human figures. The lines persist due to the extremely dry, windless, and constant climate of the Nazca region. The Nazca desert is one of the driest on earth and maintains a temperature around 77 °F (25 °C) all year round, and the lack of wind has helped keep the lines uncovered to the present day. The leading explanation for the method of construction employed by the Nasca people involves the use of simple tools and surveying equipment. Wooden stakes in the ground at the end of some lines (which were used to carbon-date the figures) and ceramics found on the surface support this theory. The area encompassing the lines is nearly 500 square kilometers (193 square miles), and the largest figures can be nearly 270 meters (890 ft) long, although the dimensions of each figure varies. The Hummingbird is 93 meters (310 ft) long, the Condor is 134 meters (440 ft), the Monkey is 93 meters (310 ft) by 58 meters (190 ft), and the Spider is 47 meters (150 ft). 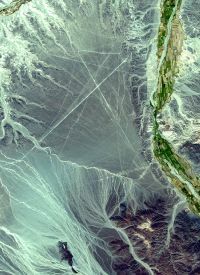 The Nazca lines did not garner the attention of modern society until the early twentieth century when airplanes began flying over the region. 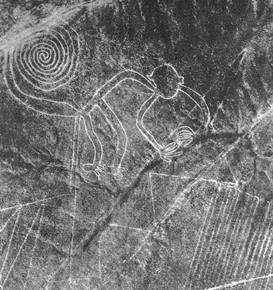 As more and more reports came in of strange markings in Peru, interest in the area heightened. In the early 1940s, American anthropologist Paul Kosok came to study the irrigation systems of ancient South American cultures, and soon became fascinated with the Nazca Lines. Not long after he was joined by German mathematician and archaeologist Maria Reiche who helped Kosok study the markings for several years. Together, Kosok and Reiche advanced one of the earliest reasons given for the Nazca Lines: that they were markers on the horizon to indicate where the sun and other celestial bodies rose or set. Whereas Kosok spent around a decade studying the Nazca Lines, Reiche spent nearly the remainder of her life studying the phenomena, revising her theory to suggest that the artwork was actually an astronomical map of constellations. Since Kosok and Reiche, numerous archaeologists, anthropologists, and other scientists have studied the area, and there are numerous explanations and theories as to the meaning of the lines. In the late 1960s, American astronomer Gerald Hawkins tested Kosok and Reiche's theories about the lines having astronomical significance and found that there was insufficient evidence to confirm their correspondence to the star locations and other astronomical phenomena. Notwithstanding Hawkins' dismissal of an astronomical explanation of the Nazca Lines and geoglyphs, astronomer Robin Edgar theorized that the Nazca Lines, particularly the biomorph geoglyphs that depict animals, human figures, birds, and "flowers" are an ancient response to what he called the "Eye of God" that is manifested in the sky during a total solar eclipse. In 1985, archaeologist Johan Reinhard published archaeological, ethnographic, and historical data demonstrating that worship of mountains and other water sources played a dominant role in Nazca religion and economy from ancient to recent times. He presented the theory that the lines and figures can be explained as part of religious practices involving the worship of deities associated with the availability of water and thus the fertility of crops. The lines were interpreted as being used primarily as sacred paths leading to places where these deities could be worshiped and the figures as symbolically representing animals and objects meant to invoke their aid. However, the precise meanings of many of the individual geoglyphs remained unsolved. Another theory contends that the lines are the remains of "walking temples," where a large group of worshipers walked along a preset pattern dedicated to a particular holy entity, similar to the practice of labyrinth walking. Residents of the local villages say the ancient Nasca conducted rituals on these giant drawings to thank the gods and to ensure that water would continue to flow from the Andes. As archaeologists and others continued to study the Nazca Lines, more theories of this ancient mystery have been generated. However, since the culture that produced these works has been gone for centuries, and left little record beyond the Nazca lines and other artifacts, the truth behind these artworks has been difficult to ascertain. 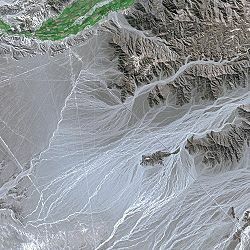 Outside of mainstream archaeology and anthropology, the Nazca lines, like many ancient and not well understood monuments, have generated numerous paranormal explanations. The most famous is Erich von Däniken's theory that the lines were created by extraterrestrials who visited the Earth in ancient times. The large size of the markings, their precisions, and the fact that their scope is best observed from the sky, led Däniken to theorize aliens had created the markings. Others, such as Hermann E. Boss have also postulated an alien origin for the lines. Author Robert Bast has proposed that the symbols of animals and humans, positioned in a way that they appear to be laying on the ground, were created out of a collective memory of an ancient flood, a theory that corresponds to, but is not necessarily the same, as the Christian belief in Noah and the Flood. Some have also suggested that the Nazca Lines are one of many mystical areas around the planet that possess energy vortices and are hot spots for paranormal activity. ↑ 1.0 1.1 1.2 Helaine Silverman and Donald Proulx, The Nasca, (Wiley-Blackwell, 2002, ISBN 0631232249). ↑ Lidio M. Valdez, "Cahuachi: New Evidence for an Early Nasca Ceremonial Role" in Current Anthropology, 35(5) (December 1994): 675-679. ↑ 4.0 4.1 4.2 Lee Krystek, The Lines of Nazca Peru, The UnMuseum. Retrieved February 2, 2018. ↑ 5.0 5.1 Peru Travel Diary, Nazca Lines Mysteries: Can anybody solve them? Ever?, Machupicchu-inca.com, 2008. Retrieved February 2, 2018. ↑ 6.0 6.1 A Mystery of the Legendary Naska's Lines in Peru Seems to be Resolved, SciTecLibrary.com, December 5, 2000. Retrieved February 2, 2018. ↑ 7.0 7.1 7.2 Nazca Line Theories, Las Lineas de Nazca. Retrieved February 2, 2018. Lambers, Karsten. The Geoglyphs of Palpa, Peru: Documentation, Analysis, and Interpretation. Aichwald, Germany: Lindensoft Verlag, 2006. A Tour of the Nazca Lines. Nazca Lines and Cahuachi Culture. The Nasca Lines Project (1996-2000). This page was last modified on 14 November 2018, at 16:08.